AdBlue is a chemical liquid used in Selective Catalytic Reduction (SCR) on diesel vehicles in order to reduce NOx levels. The AdBlue fluid (urea and demineralized water) is injected into the exhaust system just before the SCR catalyst. The introduction of AdBlue into the exhaust gasses generates a chemical reaction inside the SCR Cat which results in NOx being converted into Nitrogen and Water Vapor. 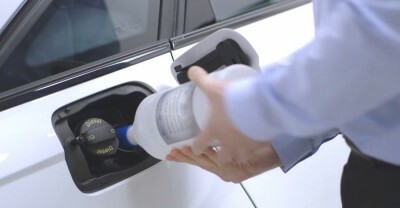 AdBlue was introduced by vehicle manufacturers in order to hit the stringent emission targets set out by governmental bodies. AdBlue is sometimes referred to as DEF (Diesel Exhaust Fluid). The AdBlue and SCR system is a relatively complex system with an array of electronic sensors, modules and pumps, these systems can fail and can be expensive to maintain. A vehicle which is used on a regular basis will consume a large amount of AdBlue and the tank will need to be refilled on a regular basis. Our AdBlue delete service will electronically disable the AdBlue system along with removing the associated dashboard lights and warning messages. Disabling the AdBlue system is normally completed by reprogramming the engine management system, however some vehicles will require a small electronic unit to be hardwired into the vehicle. Our AdBlue delete service is strictly sold as an off-road use only product, driving your vehicle on the road with an AdBlue delete could result in prosecution. Our HGV and Agricultural AdBlue service is to be used only for vehicles which are to be exported outside of the European Union. It is your responsibility to declare your modification to the relevant authorities.